From the outside, you might expect this barn to be like any other in Texas, but in reality it's part workshop and part condominium. The Barndominium (get it?) is a combo live-work space in Chapel Hill designed for a couple who is retiring to the countryside from the busy city of Houston. 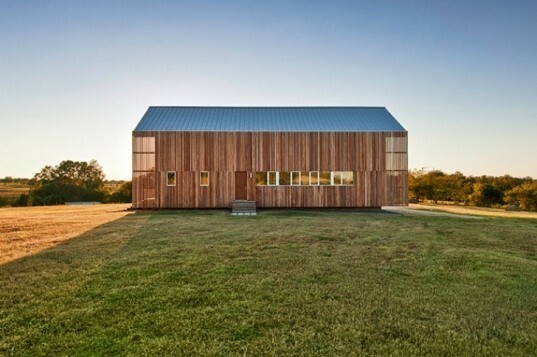 The project was inspired by both the shotgun house and barn typology, paying reference to the traditional Texas vernacular style. 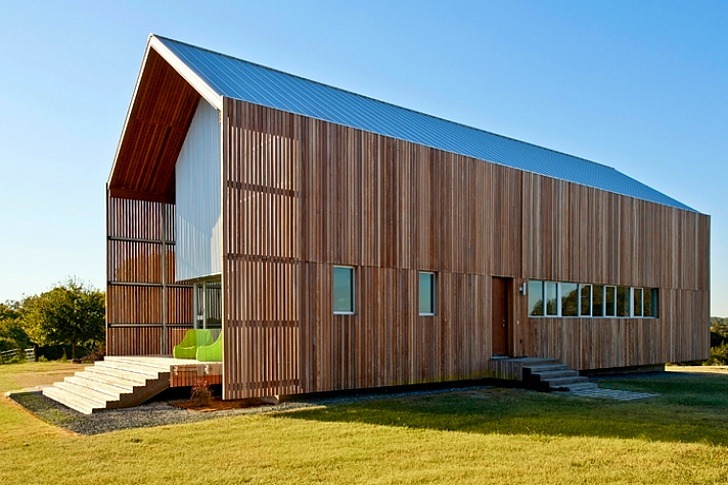 Houston-based firm LoJo also incorporated a wide range of green features into the barn/condo including a rain screen for natural ventilation, passive design and recycled denim insulation. The Barndominium is a long and narrow barn-like building with a wood exterior and a high-pitched roof. One half the building is occupied by a double-height wood workshop and the other half is a 1 bedroom, 1.5 bathroom apartment. The lower story holds the kitchen and living areas, and an office and bedroom are located upstairs. Oriented to the north and south, the living side of the building enjoys sunny views to the south of the 50-acre property plus solar heat gain. The workshop faces the north and enjoys diffused natural daylighting, which is better for more diffuse light and working conditions. The living side of the building has its own private, sealed HVAC systems to keep the air separate from the workshop area, which makes use of more passive ventilation techniques to move in fresh air from the operable windows on the east side. Recycled denim insulation is used throughout the home in the walls and the roof, while a Ipe wood rain screen serves as cladding on the exterior. This rain screen, which is slightly offset from the building, allows air to circulate around the house, keeping it cool. The rain screen also hides the gutters and downspouts from view. Raised off the ground to allow for a crawl space and access to plumbing, mechanical, and electrical systems, the elevated home avoids problems associated with the high clay content found in Texas soil. The Texas couple hired LoJo to design their retirement home and retreat in Chappel Hill, located to the southeast of Houston. Eventually the couple will have a residence in addition to their Barndominium, but they wanted the live-work space first so they could immediately being to use and enjoy it. After the official home is built, the Barndominium will continue to be used as the workshop, but the living space will be used for guest quarters. Until then, the barn/condo is a lovely example of a small space living and a modern live/work space set in a more traditional architectural space. The Barndominium is a long and narrow barn-like building with a wood exterior and a high-pitched roof. One half the building is occupied by a double-height wood workshop and the other half is a 1 bedroom, 1.5 bathroom apartment. The lower story holds the kitchen and living areas, while an office and a bedroom are located upstairs. Oriented to the north and south, the living side of the building enjoys sunny views to the south of the 50-acre property plus solar heat gain. The workshop faces the north and enjoys diffused natural daylighting, which is better for more diffuse light and working conditions. The living side of the building has its own private, sealed HVAC systems to keep the air separate from the workshop area, which makes use of more passive ventilation techniques to move in fresh air from the operable windows on the east side. Recycled denim insulation is used throughout the home in the walls and the roof, while a Ipe wood rain screen serves as cladding on the exterior. This rain screen, which is slightly offset from the building, allows air to circulate around the house, keeping it cool. The rain screen also hides the gutters and downspouts from view. Raised off the ground to allow for a crawl space and access to plumbing, mechanical, and electrical systems, the elevated home avoids problems associated with the high clay content found in Texas soil. The barn/condo is a lovely example of small space living. It's also a modern live/work space set in a more traditional architectural space.